one // I recently received two pairs of gorgeous leather earrings from Tenfold Collective. Not only am I obsessed with my newest accessories, I love their mission — to raise awareness and abolish human trafficking. two // I am SO proud of myself. Y’all, I completed our 2017 family photo album!! It took me like a billion hours but it’s done and I couldn’t be happier to add it to our collection. After doing our 2016 album I decided to reorganize how I store all of my photos to make this process easier. For 2017, I created a folder for each month, and within that folder I have individual folders for each activity/event. I design my albums by month, so for January I could quickly compile all of those photos into the book, by event. It made it SO much easier this year. Also, I use Blurb to create all of my books, but I’m not necessarily a huge fan of it. I love their quality, but their collage template options aren’t the greatest, so I end up making my own collages in PicMonkey before uploading them to my books. 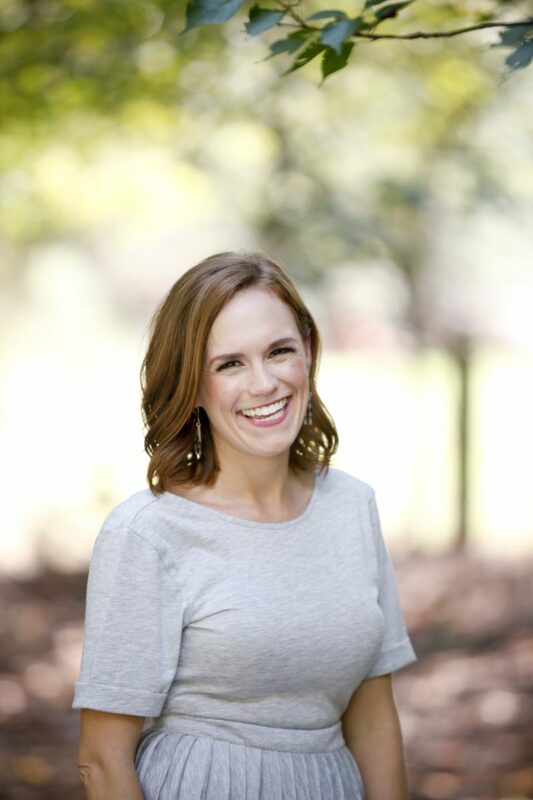 Let me know if you have a photo album website you love! We display our albums in a wire basket in our book cases. three // Now that Whole30 is behind us, Matt and I are sticking to a low carb diet to lose the last few pounds to get to our goal weights. I’m always on the hunt for new low carb food options and recently tried some Keto products! So far we’ve tried the shakes (adding in bananas), artificial sweeteners in our coffee and the dry riced vegetables! I was super skeptical about the dry veggies but they were actually SO good and Thomas couldn’t get enough of the riced broccoli! We also have some hot breakfast items to try too! four // I haaaaaaaaave to share the most amazing workout pants I’ve ever owned. For Christmas I wanted to ask for some new workout leggings and had no clue where to start. Then I saw a post in a local mommy Facebook group with 75+ comments on the best workout leggings…and these High Waist Tummy Control Capris & High Waist Tummy Control Leggings were recommended over and over and over on the thread…and they are from Amazon (with 3500+ reviews)! They come in TONS of colors and are $34 for TWO PAIRS!!!! They are apparently the Zella knockoffs and I am obsessed with them. five // A few weeks ago Amazon was running a sale on Echo Dots if you bought three. So I bought three because I can’t pass up a good deal. We now have one in each of the kid’s rooms and one in the kitchen. But it has come to my attention that I am definitely under utilizing Alexa!!! Besides asking her for the weather forecast, playing music, telling us jokes and setting timers, what should I be using her for?! What am I missing out on? I love those leather earrings!! They’re so cute!! I’m also super impressed that you finished your 2027 album. I keep saying I’m going to finish ours, but for some reason it hasn’t happened! Haha. Happy Friday!! We love our echos! You can set them up to call each other (like an intercom). Say "good Morning" to it to get a little fact for the day, and "tell me the news" for an NPR briefing. It will also play podcasts and radio stations. My FAVORITE though, is that we have it set up to turn lights on and off (I told husby I thought this was gimmicky, until the morning we were leaving for school and I was hands full of stuff with a four year old, and could say "Alexa Good Bye" – and ALL the lights turned off. Boom. Genius.). Happy Friday! Well there has only been one comment on what you can do with Alexa and I'm already ready to pull the trigger! I've heard awesome things about those leggings too, so glad you are loving them! Have a great weekend, girl! We also got the dots on sale this past holiday season and I’m not using them to their full potential. I did find a lullaby channel that is even awesome for adults. Modern songs played instrumentally but calming; I just asked Alexis for lullaby. So relaxing as I’m winding down for the day!Thanks for sharing those leggings. I’ve been debating about the Zella leggings but haven’t yet; there leggings are in my cart! LOVE LOVE the 90 degree pants. I think I own at least 5 pairs, I wear them everyday and they are still holding up well in the wash almost 2 years later! Love the photo book idea! My husband and I have been doing keto for just over a month, and we're loving it! I think there are so many great low-carb options on the market today that it really makes it easy! I love having the Echo play audio books! Sometimes when my little one is nursing or just playing in her nursery, we opt for a book rather than music–the dramatised Judi Dench version of Winnie the Pooh right now, to be precise! So sweet. And funny. Also, I am struggling with online photo storage organization so I would LOVE to hear what system is working for you! Am trying to complete our 2017 album and baby's first year albums and could use some tips! I make all of our albums using Shutterfly – they have tons of page options & you can edit the layouts as much or as little as you like. I started making my then-boyfriend, now-husband an album each year for our anniversary in November. He’s getting the 2017 album of Valentine’s Day this year. Better late than never! They definitely take time but are so fun to look back on! 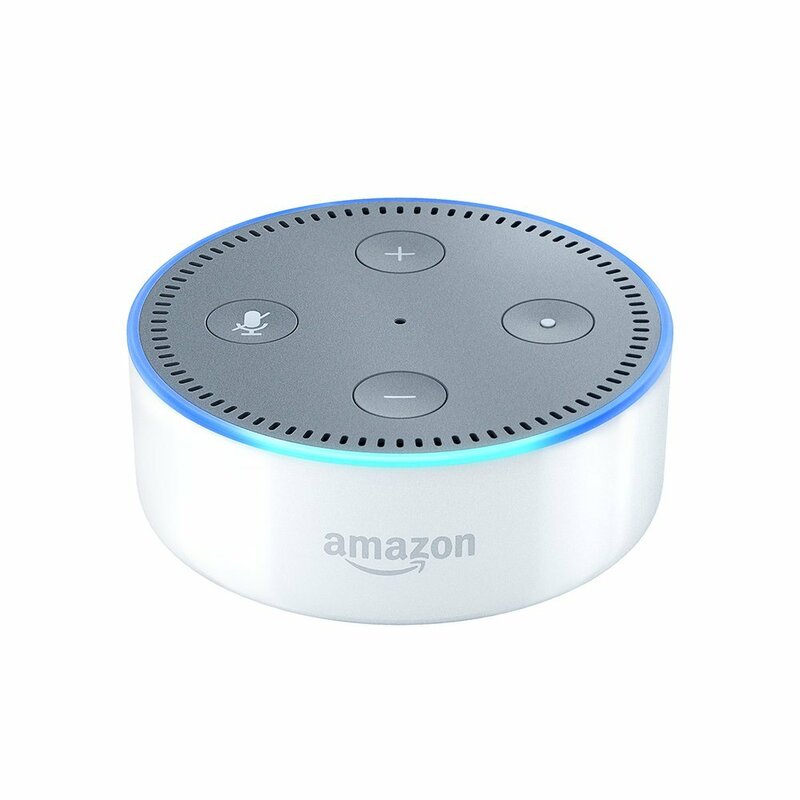 We have an Echo Dot in our bedroom and use it as a sound machine, definitely can't sleep without it now. We even travel with it, ha! LOVE those leggings, thanks for sharing!! We use Shutterfly for our photo books and LOVE it. I always wait until they have a coupon (50% off or FREE!!). I've never had a problem with them, great quality and the photo books make the best gifts! Love how you display yours! Those leggings look amazing!!! Thanks for sharing them. I'm also loving your new earrings. Hope you have a great weekend. 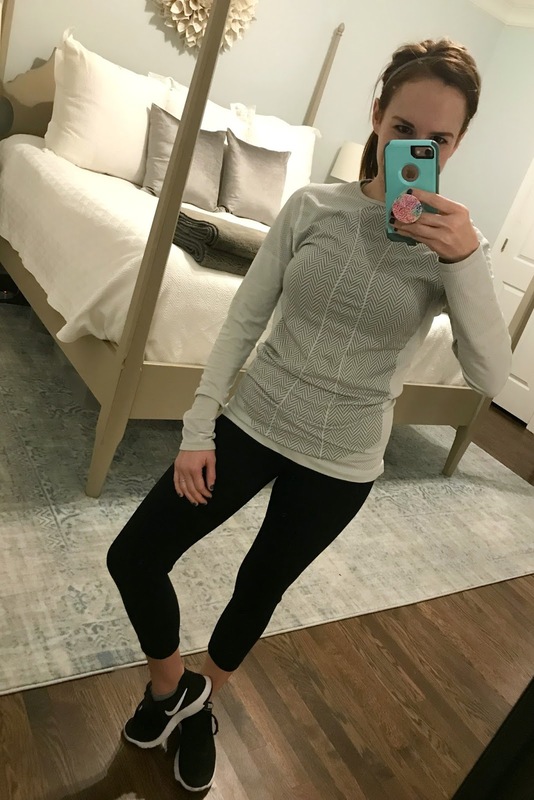 I discovered those leggings at TJ Maxx this past fall and they seriously are amazing! Glad to know Amazon has more color options! I have to get on the Amazon Echo/Dot train! I feel so behind the times! PS – Love your photobombers in your first pic. 🙂 Have a great weekend! I wish I could get my act together and do photo books. YAY for you. I'm checking out those leggings. The Zella capri's are my favs. Happy Friday!!! We have Alexa and I'm still trying to figure out how to maximize its use! I love the alarm for bedtime and naptime for my daughter, and we love listening to music on it! Also kudos to you for getting your photo album done; these always take me forever, but I love having them to look through! What I meant to say is… we listen to Nursery Rhyme Parade on our Echo. Bonus is that her voice is very soothing and not obnoxious like a lot of those other kids songs are. I've never heard of Riced Broccoli before. I'll have to give it a try. 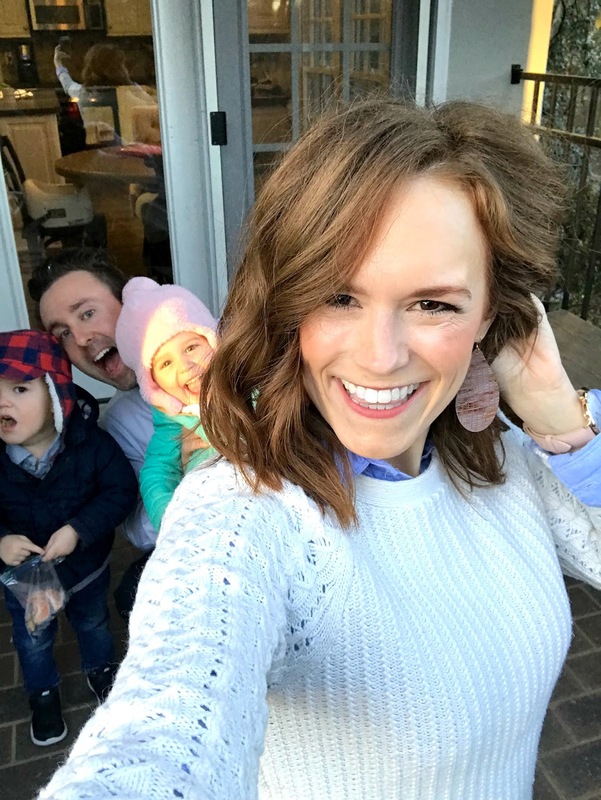 You had me at Zella knockoffs – I live in my Zella pants but they are so expensive and I usually wait to get a new pair during the Nordstrom sale. I will check these out! I have the SAME gold python Tenfold earrings!! Great organization! We are BIG fans of riced cauliflower. Google chicken fried rice cauliflower for lots of great recipes. It's in our weekly rotation.